Martha Caldera, a senior at West Orange High School, is posing in front of her pop culture design that illustrates a punch-line about tardiness. She recreated her favorite artist Drake’s album If You're Reading This It's Too Late with her own take that reads, "If you're reading this I'm late." Self-expression. That’s what painted parking spots symbolize. The senior class should be entitled to spend their last year bonding while transforming their lifeless parking lot into a revolutionary masterpiece. The art is more than a decoration. It serves as a unique school tradition that honors individuality and recognizes that seniors have reached their final stage of high school. Students could use the activity as an opportunity to express themselves and bring personality to their school, spread pride in their community and create a sense of unity among their friends. Schools across the nation, such as West Orange High School in Florida and James Bowie High School in Texas, are revamping their parking lots by illustrating within the borders of their own personal parking spaces on campus. The senior classes of 2017 let their imaginations come to life—from recreating their favorite moments of pop culture to making puns about their names— the students did not fail to reflect their passions on the personalized units of concrete. 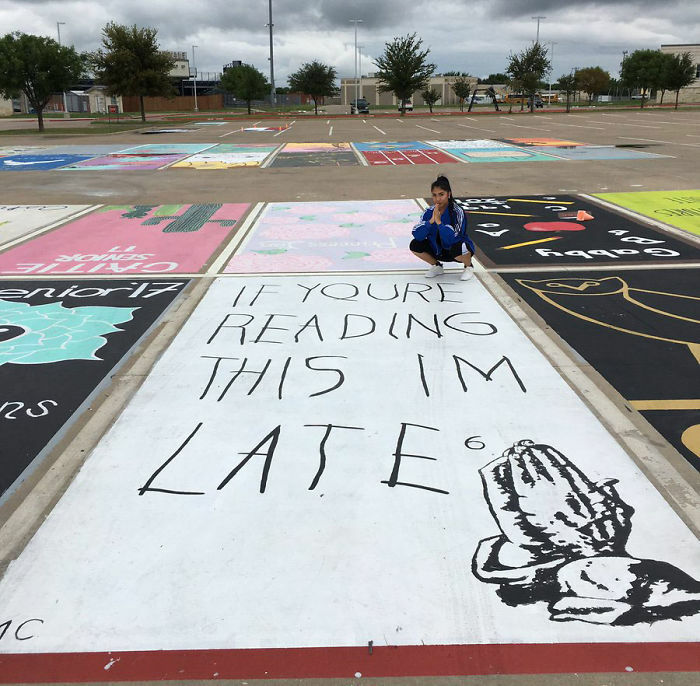 One West Orange student, Martha Caldera, went viral for painting Drake’s album If You’re Reading This It’s Too Late with her own comedic twist that states, “If you’re reading this I’m late.” In terms of Sage Creek, giving seniors the upper parking lot to themselves would allow them to choose the most easily accessible spots on campus. 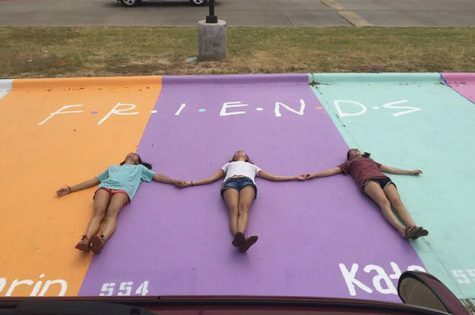 Three high school seniors successfully created a group design based on the television show “Friends.” Their collaborative parking spots linked their friendship together for the whole school year. Not only is this project a remarkable way to inspire self-expression and individuality, but it is worthwhile for students to embrace the arts in today’s educational system. Since 2008, approximately 80 percent of U.S. schools have had funding downsized, and the arts are generally the first to be cut from the curriculum. When schools stifle artistic talent, it is vital that students utilize these opportunities as a source to manifest their creative abilities. Furthermore, enhancing parking spots is an excellent way for seniors to kick off the school year and put aside their weary feelings of senioritis. Putting an end to the tranquility of summer and going back to school is always brimming with anxiety and apprehension. Nevertheless, it also uplifts students when they see their friends again and reunite. It’s particularly bittersweet for seniors, as this is the last year they get to spend with the people they grew up with. High school seniors deserve the chance to have one last memorable experience together that they can take away from our campus and never forget. I think this is such a cool idea! We have a lot of artistic seniors and future seniors who I’m sure would love to participate in this. Maybe there could be a survey put out to all the seniors asking if they like the idea. Yes, please. Stop holding us back from what we love because of what you’re worried about the one kid who will make a bad decision.